Brazilian man finds his perfect doppelganger in a roadside traffic sign, just has to stop and pose. 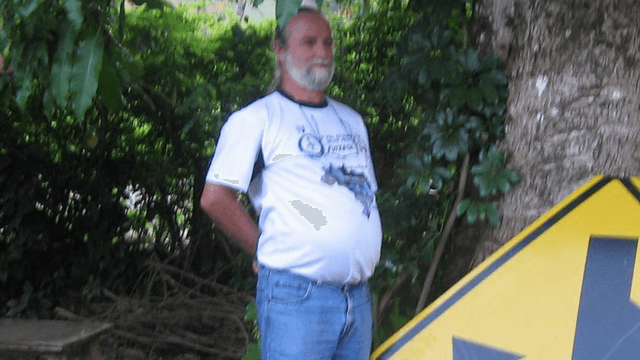 A Brazilian man with a dad bod and a dad sense of humor saw a roadside traffic sign lying on the side of the road. Then the world stopped, everything snapped into place, and inspiration struck. It was the perfect moment. All signs pointed to dad joke. It's from Brazil, but this story transcends language. According to the Classic Dad's daughter, Fernanda Lizardo, "He loves to make fun of everything. The sign was lying on the side of the road. He raised the plate, positioning it so that the arrow pointed to his belly, and posed." Early candidate for father of the year right here.